Cross-country skiing (or XC skiing) is to travel over snow-covered terrain using skis. Cross country skiing can be a recreational activity or a sport. The sport of cross-country skiing was developed by Danish-Norwegian, Carl Schack Rantzau. There are two different styles used in cross-country skiing, classical style and freestyle events. In classic style, the skiers propel themselves by striding forward, while in freestyle they can use the side-to-side movement in a skating motion. In both styles, the athlete's movement forward is aided by the arms pushing on ski poles against the snow. 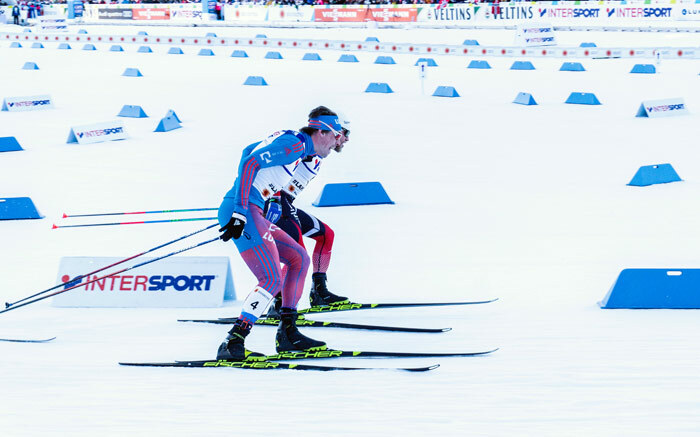 The skis used in cross-country are lighter and narrower than used for downhill skiing, and the skis also differ for classical and freestyle events. Classical skis are waxed to make them tackier, while the skis used for freestyle events are more slipperier. The ski boots used for competition are also lighter than the recreational shoes. The different styles are used on different surfaces: the classic is best on undisturbed and tracked snow, while skate skiing is used on firm, smooth snow surfaces. There are also cross-country skiing marathon events organized by the Wordloppet Ski Federation, also there are cross country ski orienteering events which is organized by the International Orienteering Federation. Some of the popular international competitions are the FIS Nordic World Ski Championships, the FIS Cross-Country World Cup, and the Winter Olympic Games. Biathlon — a combination of cross-country skiing and rifle shooting. Nordic Skiing — a field of competitive skiing which includes all events where the heel of the boot cannot be fixed to the ski (as opposed to Alpine skiing). Nordic Combined — a Winter Olympics sport combining Cross-Country Skiing and Ski Jumping. Telemark Skiing — The bindings for telemark skiing holds the boot by the toes, unlike Alpine Skiing which is fixed-heel. Also known as free hill skiing and telemarking. Ski Mountaineering — the objective is to climb up a mountain wearing skis, occasionally carrying if required, and then descend on the skis. Ski Orienteering — the objective for athletes is to navigate from the start to the finish through checkpoints while riding on skis. Roller Skiing — races are conducted on tarmac road courses with athletes wearing snow skis with wheels attached. Snowshoeing — racing in snow wearing snow shoes.